Dynamic clamp is an electrophysiological technique for introducing simulated electrical components into biological cells using a real-time closed loop between the cell and a computer or another electronic device. Classic dynamic clamp protocols build a voltage-dependent current injection cycle to implement artificial membrane or synaptic conductances in the cell membrane of biological neurons. These protocols are employed to assess a large variety of neuronal computational properties and are widely applied for studying the physiology of neural systems at the cellular and circuit levels. The use of closed-loop feedback interactions with living neurons for observation and control purposes goes back to the beginnings of electrophysiology when the voltage clamp technique was developed (Marmont 1949; Cole 1955). The voltage clamp technique measures currents across the membrane of excitable cells while holding the membrane potential at a constant level. In current clamp, on the other hand, the current passing into and out of the neuron is tightly controlled, while the membrane potential is being recorded. Both voltage and current clamp protocols are routinely used to study the electrical properties of neuronal membranes and contribute to the design of conductance-based neuron models. In the early 1990s, the first hybrid circuit experiments coupling living and artificial cells through synthetic electrical connections were carried out in heart cells (Tan and Joyner 1990) and neurons (Yarom 1991). In 1992, Sharp et al. and Robinson and Kawai independently developed the dynamic clamp concept (Sharp et al. 1993; Robinson and Kawai 1993). The dynamic clamp technique operates in a real-time closed-loop manner: an intracellular electrode measures the membrane potential of a neuron, which is fed into a computer or an electronic device that calculates a current to inject into a postsynaptic neuron. The injected current is computed after solving a model that represents ionic or synaptic conductances or simulates the dynamics of individual neurons or neural networks. The postsynaptic cell can be the identical to or different from the one from which the membrane potential is being recorded. This activity-dependent closed loop is repeated indefinitely and has to be implemented at a high enough frequency to achieve a realistic effect. Figure 1 illustrates a typical dynamic clamp configuration. 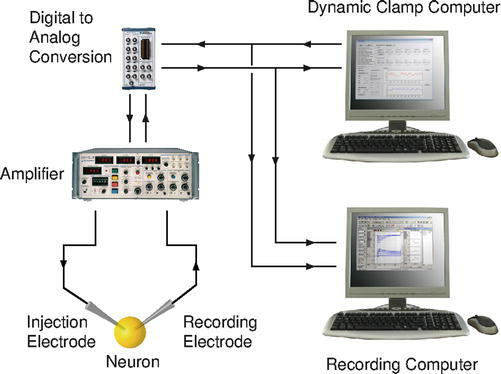 The dynamic clamp technology for in vitro and in vivo electrophysiology has produced many examples of successful closed-loop interactions with neural systems, which include adding or cancelling ionic channels, adding or cancelling electrical or chemical synapses (including learning and plasticity protocols), and implementing hybrid circuits of real and artificial neurons and networks (for reviews see Prinz et al. (2004), Goaillard and Marder (2006), Destexhe and Bal (2009), and Economo et al. (2010)). Different dynamic clamp software implementations have increasingly become available under both Windows (Pinto et al. 2001; Kullmann et al. 2004; Nowotny et al. 2006; Kemenes et al. 2011) and real-time Linux operating systems (Butera et al. 2001; Dorval et al. 2001; Muniz et al. 2009; Lin et al. 2010) and contribute to expand the use of dynamic clamp protocols by implementing a realistic cycle update in soft or hard real-time approaches. Novel active electrode compensation techniques also allow experimenters to conduct dynamic clamp experiments with a single high-resistance electrode (Brette et al. 2008; Samu et al. 2012). The dynamic clamp technique has been generalized in the context of activity-dependent stimulation protocols beyond electrophysiological input/output by using chemical and mechanical stimulation and optical recording methods (Chamorro et al. 2012). Dynamic clamp-inspired closed loops can also be used in novel assisted neurofeedback techniques by implementing goal-driven stimuli that not only depend on instantaneous measurements but also on an adequately long history of the recordings (Wallach et al. 2011; Chamorro et al. 2012; Fernandez-Vargas et al. 2013). Dynamic clamp and novel activity-dependent stimulation techniques reveal neural dynamics otherwise hidden under traditional stimulus–response protocols, provide control of regular and pathological states, induce learning processes, bridge between distinct levels of analysis, and lead to a further automation of experiments in neuroscience research.